So the front orchard is going to need water. I could have just run the irrigation hose to the back tanks, but noooo that would have been easy. 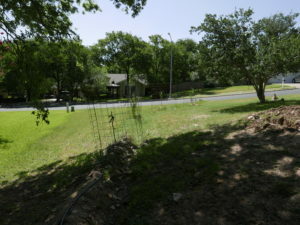 Instead I chose to harvest more water off the front of the house where very little water is harvested. I already have two 55 gallon barrels taking in water on the front, those water the fig tree. They only catch a fraction of the rain from 1200 sq ft of roof surface during a rain. So I put in another rain downspout, and ran it under the sidewalk. 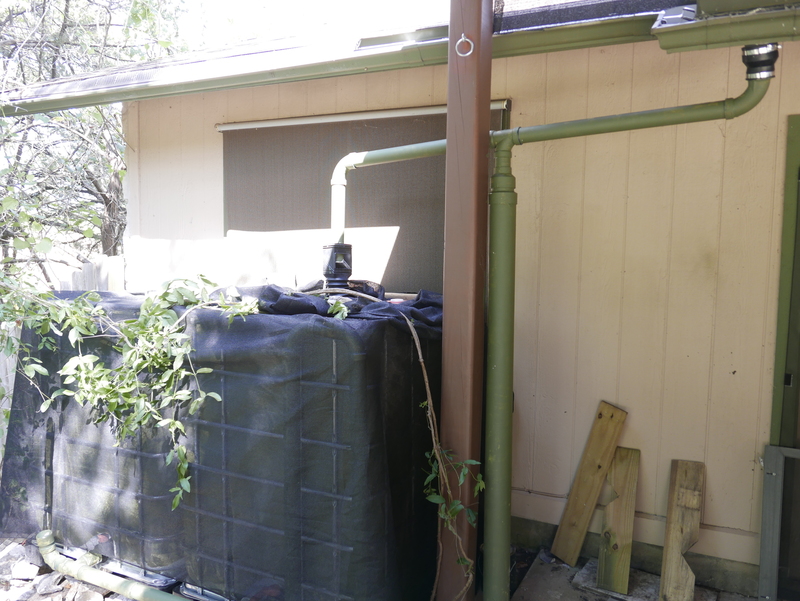 The tank is a 330 gallon IBC tote, painted and with a shade cloth to mitigate algae growth. 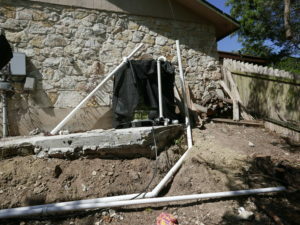 Downspout then goes under the sidewalk before turning the corner. 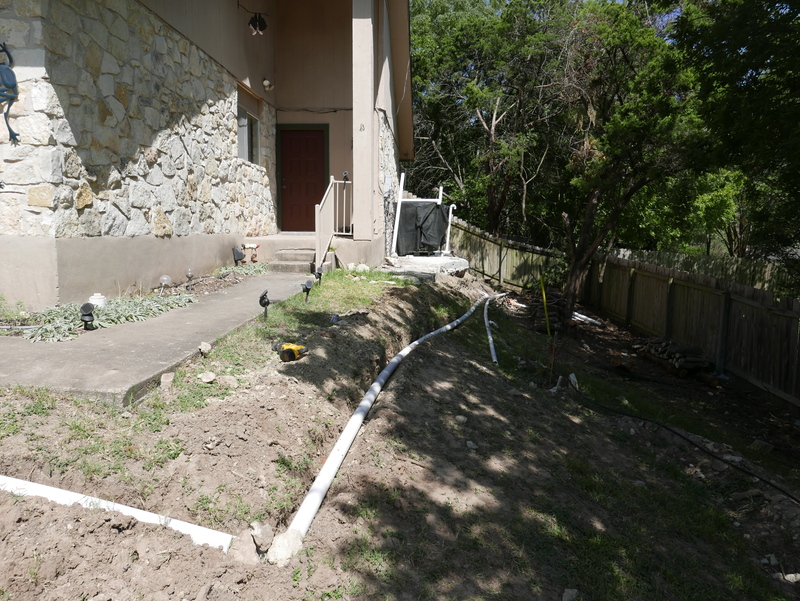 The trick is that I met the pipes that lead into the house from the City of Austin and couldn’t bury my pipes deep. The easy way to tunnel under a side walk is using a water hose with water going full blast and shove it under. It erodes out the dirt and I can reach under and pull out the rocks. Took 20 minutes to dig the trenches on each side of the sidewalk but only took 10 minutes to burrow under. 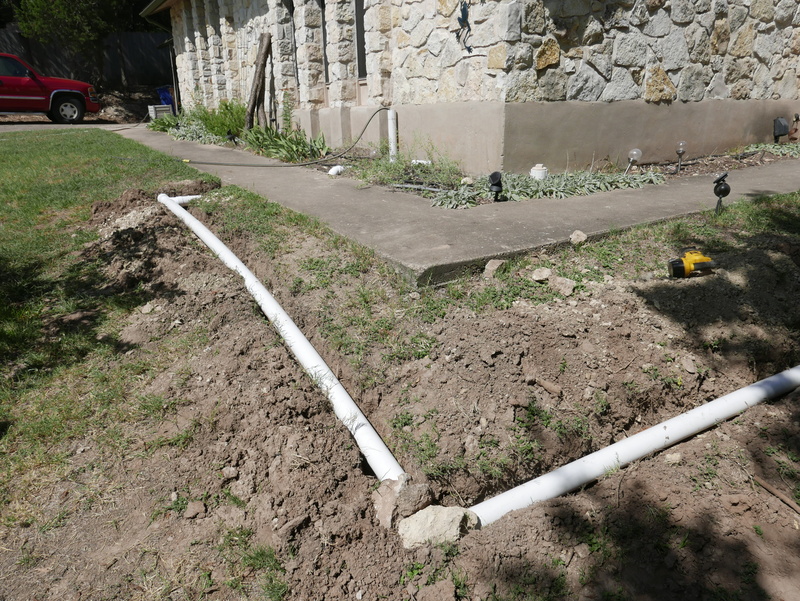 So the premise is the water will fill up the pipe, go down, then go back up the pipe and fill into the tank because the tank level is lower than the starting downspout level. 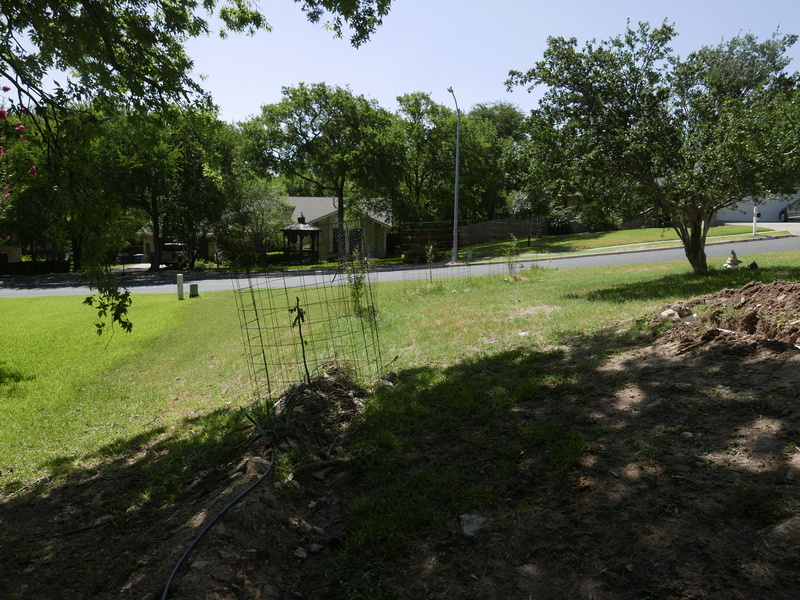 The 3″ lines go to the tank and up, the smaller 2″ lines fill the same trench and will go to the swale downslope. 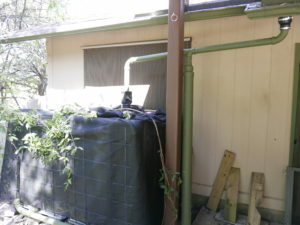 Then it rained a week later, the tank filled up and then overflowed, because I forgot to drill anti siphon holes on the top of the overflow U, the entire tank drained out. But I discovered that at the end of the rain and fixed it, so the tank filled 1/2 full before the end. The tank has a 3″ inlet pipe and a 2″ outlet overflow pipe. The slope of the side of the house puts the overflow lines at an odd angle because I only had 45 and 90 degree elbows to use. 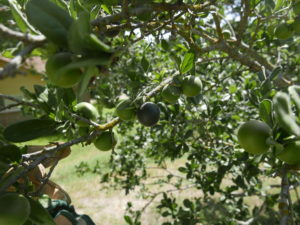 The front orchard has 8 trees in it: 2 Texas Persimmons (at least 40 years old), 2 jujubes, 2 Pomgranates, and a VDB fig. 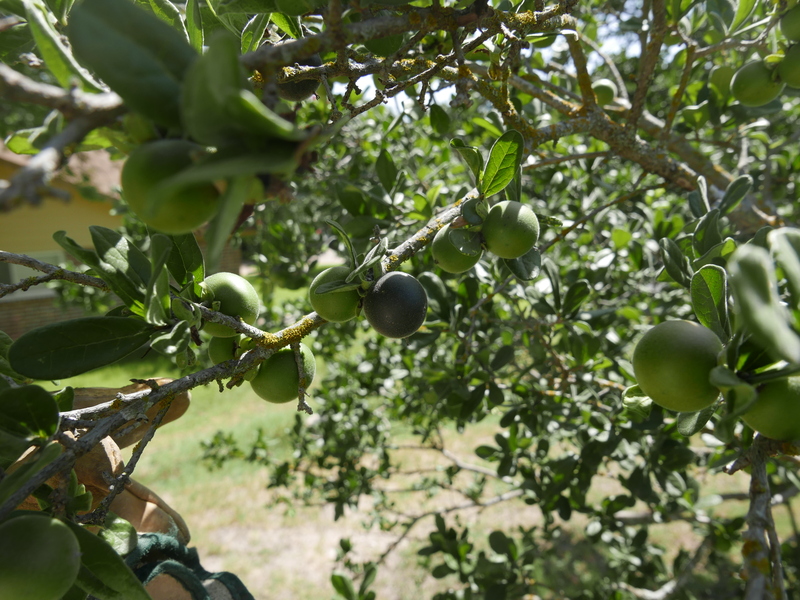 The Texas persimmons turn black when ripe. I measured 19% sugar with my refractometer, but they don’t very taste sweet. The backyard dual tanks of 660 gallons. Overflow goes to the middle swale in the yard. The Pomegranates and Jujube trees. Posted in musings, news by admin with no comments yet.